The IMF today released its Article IV assessment of the Euro area, so as usual, I will be blogging on the issues raised in the latest report throughout the day. The first post looked at debt overhang while the second post presented IMF views and data on the euro area banking sector woes. Here, let's take a look at headline growth outlook. 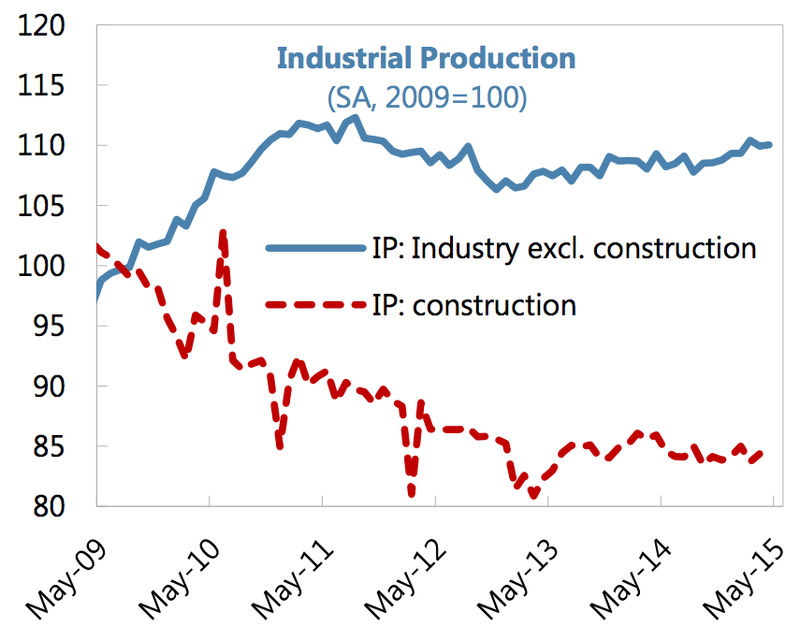 Based on the IMF view: in the Euro area, "the recovery continues. After weakness through mid-2014, growth picked up late last year and has continued in 2015, driven by domestic demand. Private consumption remained robust, reflecting rising employment and real wages, while fixed investment has expanded moderately. Among the large economies, Germany continues to grow slightly above 1½ percent, while Spain is rebounding strongly. Italy is emerging from three years of recession, and activity in France picked up at the beginning of this year." 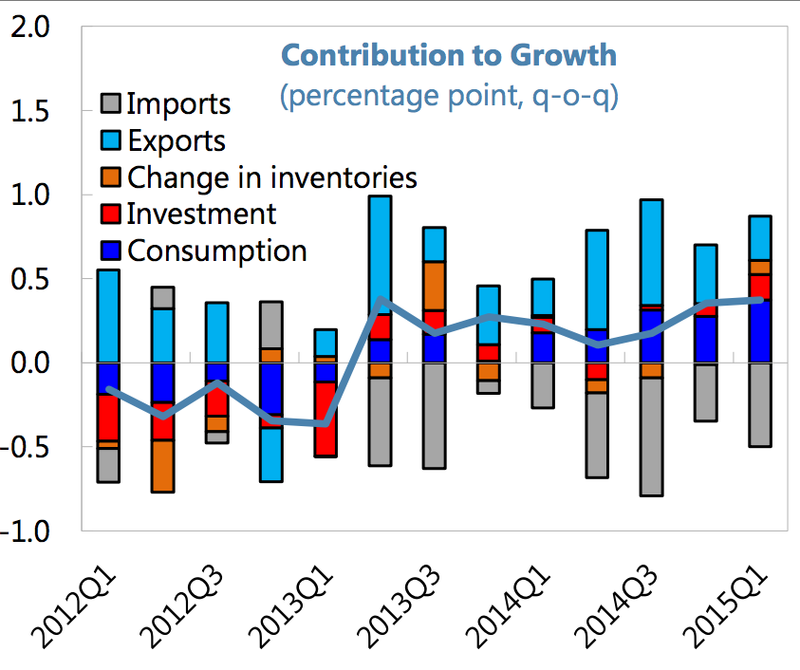 And more: stripping the uplift in inventories, headline GDP growth in 1Q 2015 would have been worse than in 4Q 2014. 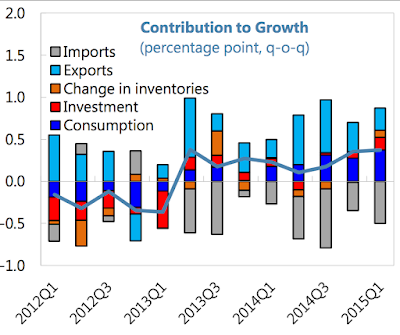 And, despite collapse in oil (energy) prices and increase in consumption, imports have increased their drag on GDP growth. So the net medium-term result is bleak: "Despite the cyclical upturn, growth of only about 1.6 percent is expected over the medium term, with potential growth averaging around 1 percent. The output gap would close around 2020 with unemployment still near nine percent and inflation reaching 1.7 percent, somewhat below the ECB’s medium-term price stability objective. 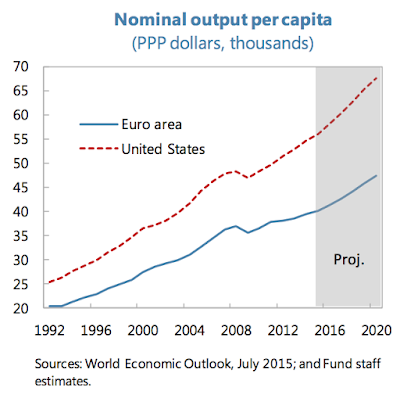 The picture is more disappointing in comparison to the U.S. with the per capita income gap now the largest since the start of EMU, and projected to widen further." Monetary easing. Current interest rate policy continues through 2020 and QE through September 2016. Fiscal space within the SGP. 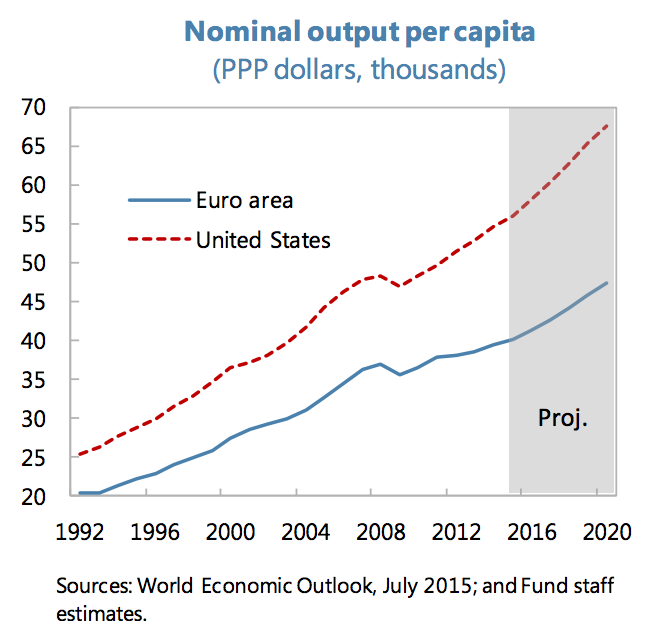 For the eurozone, fiscal space available within the SGP could amount to 0.6 percent of euro area GDP. This includes (i) room under countries’ Medium-Term Objectives (MTOs) (0.3 percent of euro area GDP); (ii) SGP flexiblity that a few qualifying countries could use for structural reforms (0.2 percent of euro area GDP); (iii) windfalls from lower interest payments due to QE (0.1 percent of euro area GDP) for one-off investments or structural reforms for a few countries already meeting their MTOs; and (iv) growth-friendly fiscal rebalancing for countries with limited fiscal space to lower the labor tax wedge by two percentage points, financed by base-broadening measures. Centralized investment. An increase in private investment of 0.2 and 0.8 percent of euro area GDP in 2015 and 2016 is assumed, which is equivalent to 1/3 of the targeted amount of European Fund for Strategic Investments (EFSI) projects. Clean-up of bank and corporate balance sheets A fully functioning credit channel is simulated as a decline in corporate borrowing rates, by 80 basis points in Italy, 25 basis points in Germany and France, and 50 basis points in the rest of the euro area. This would bring the spread between selected and core countries roughly to pre-crisis levels. 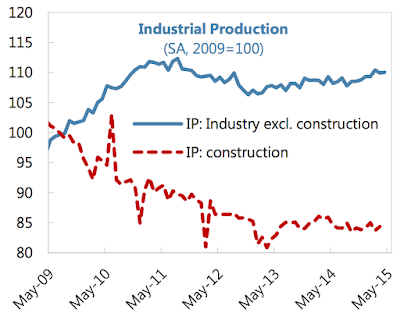 Structural reforms. 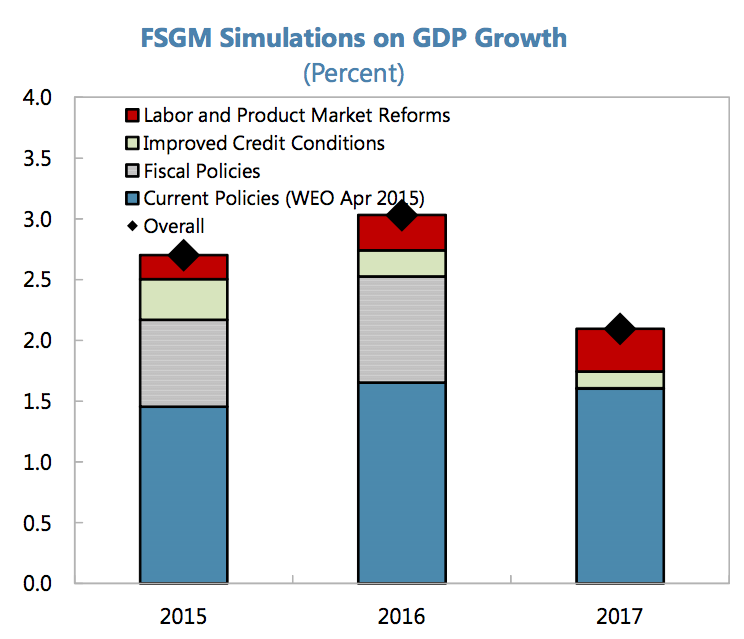 Gradual implementation of product and labor market-related reforms in the 2014 G20 Comprehensive Growth Strategy could increase total factor productivity (TFP) by about 0.1 percent in 2015, 0.5 percent in 2017, and 0.9 percent in 2020. The implied TFP changes would differ substantially among member countries, with France, Italy, and Spain enjoying the largest gains." So combined effect of the above over the longer term: "The growth dividend of a balanced policy mix can be large. The EUROMOD module of the IMF’s Flexible System of Global Models (FSGM) points to a substantial growth dividend, particularly from fiscal policies and the improvement of the credit channel. 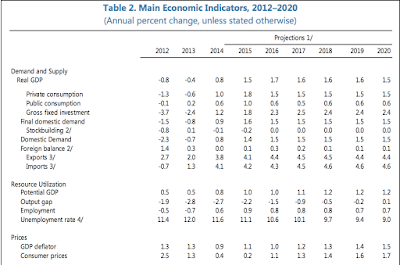 Real growth for the euro area would increase by 1.3 and 1.4 percentage points to 2.7 and 3.0 percent for 2015 and 2016, and HICP inflation rate in these two years would rise to 0.6 and 2.1 percent. The output gap would close by the end of 2016, about four years faster than in the baseline, and unemployment would be 0.8 percentage point lower than in the baseline by 2016." 2) Even with all things going the IMF way, unemployment will remain atrociously high. In other words, growth uptick even in the best case scenario is likely to be largely jobless. Expect the expected: looser fiscal policy being the largest new contributor to growth in 2016; labour markets and product markets reforms being marginal - adding at most 0.25-0.3 percentage points to annual growth rates. The fabled 'credit conditions improvements' (banks doing their bit for growth) is expected to be minuscule (despite all the hopes attached to them by the likes of Irish authorities and all the resources of the state devoted in 2008-2011 to repairing them). 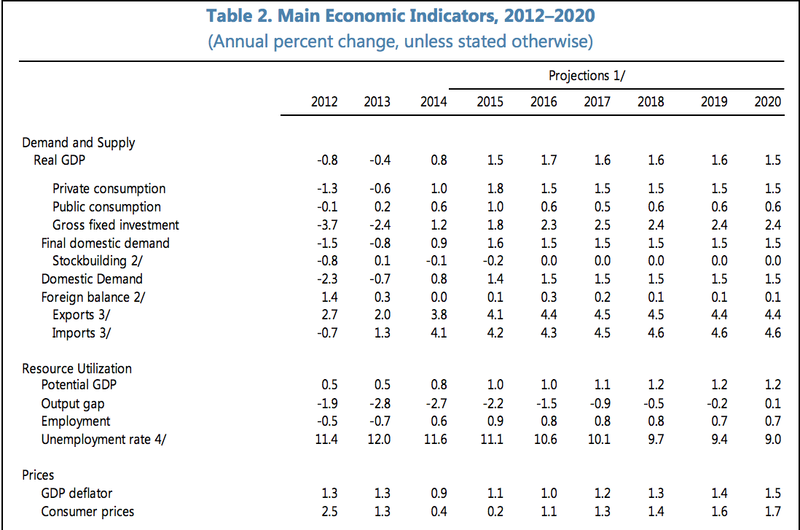 And headline growth expectations for baseline scenario still resting at 1.7% and 1.6% GDP growth in 2016-2017. Yep, the first line of projections above shows perfectly well the poverty of low aspirations that Euro area has become, while the unemployment rate projections confirm the same. Everything else - all the talk about structural reforms, growth drivers and the rest - is pure unadulterated bull. Even in the age of massive QE, collapsed oil / energy costs, and improvements in [sliding back on] fiscal 'reforms', the euro area remains the sickest economy in the advanced world.